In Addition to Diving, There are Many Other Great Things to do in Utila! There are many different things to do in Utila. Of course, the number one activity in our what to do in Utila list is diving. Utila is famous in more than one way for its diving: for one, it is world renown as the most affordable place to get scuba certified. It is also famous as one of the few places in the world where you can see whale sharks throughout the year. Although Utila is a relatively small and new community, there are several interesting sites to visit if you are in the mood to explore the island. I would start at the municipal dock and head on down on Cola de Mico road. You will soon arrive at the Jade Seahorse complex, where I urge you to enter. Both the Jade Seahorse Restaurant and the Nightland Cabins are part of a unique artistic setting that is worth while visiting. Artist Neal Keeler has spent years of creative building to put together this attractive complex, where you will find a bit of everything, from a dragon like real size sculpture at the entrance to the Restaurant; to unique old artifacts that tell a story of about the early days in Utila. Just before the entrance to the Jade Seahorse you will find a unique old “Indian Well” that to this day provides water for some of the neighbors. Within the complex you find a nice garden, with secret areas to sit down, relax and enjoy the artwork. The rooms at Nightline cabins are worth seeing, they are all unique and different. If you continue on the road just a short distance, you will come to the Mango Inn, this is probably the most popular hotel in town, offering a nice pool, a nice garden area with a restaurant that caters to both hotels guests as well as non guests. The Mango Inn is at a crossroad; take a left to go up the hill, and you will see a variety of different homes lining the street. Continue until you get to another street, and take a left to go back into town. You will arrive at the Bay Island College of Diving and the entrance to the Utila Lodge, one of the premier diving resorts in Utila. There is a pleasant little park here that you will enjoy. If you continue down this road towards the West, you will be headed towards Chepe’s Beach, this is the popular community beach in Utila. Don’t expect a large beach, because it is actually quite small, but Utilians love to come to the beach on weekends and enjoy some time here, regardless of its size. Beyond Chepe’s Beach you will find a couple of resorts, some private homes, and you will eventually arrive at Blue Bayou, where the road ends, since there is an entrance to a lagoon here. The Laguna Beach Resort and Utopia Village are on the opposite side of the lagoon, on some very nice beaches, but you will need a boat to get you out to these, the two most upscale and private resorts in Utila. Personally, this is one of my favorite things to do in Utila, simply walk around town and enjoy the sight of life moving on at its own pace in paradise! 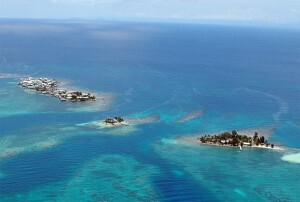 Utila’s smallest community, the Utila Cays are located just off the southwest end of Utila. There are several keys in this area, many of which are privately owned. One of them Water Cay is favorite spot for a beach picnic and for all night parties. The two largest of these cays: Pigeon Cay and Jewel or Suc Suc Cay, are connected by a small concrete bridge and constitute the second largest community in Utila with a population of about 500 persons. This is truly an authentic Caribbean village, where everyone in town knows each other and families are tightly knit. There are several small hotels and restaurants here, and you can enjoy a pleasant day here. The easiest way to get to the Utila Cays is to take the Captain Morgan’s Dive boat that departs from the Pirates Bay Hotel every morning at 7:00 a.m. and returns at 5:00 p.m. You can also arrange for a private boat to take you there. If you have the time, this is certainly one of the things to do in Utila you should not miss out on. Visiting a tightly knit fishing community in the Caribbean is not something that is easily done elsewhere! Located a few miles east of Utila are the Cayos Cochinos, also known as the Hog Cays. This unique set of two small islands and 13 cays is home to a national park that is truly an authentic paradise. You can arrange for a charter aboard the Gypsy Moth, a 54ft sailing yacht, with an experienced captain and crew. The trip, which will take a few hours sail from Utila will feel short while fishing and looking out for dolphins on your way to the stunning anchorage of Cochino Grande. From there explore the reef or hunt for the pink boa on land while hiking to a scenic vantage point. Have lunch on the picturesque island of Chachahuate with the local Garifuna community and swim in the beautifully clear waters. Sit on deck and star watch at night will sipping rum like a real pirate. Dory trip to Rock Harbour. Board a classic dory trip to navigate through the National Park Mangrove Canal that crosses the island of Utila. The canal winds you through the tranquil mangroves that make up most of the island of Utila and brings you out in the scenic Rock Harbour, arguably the bay islands best uninhabited beach. Feel like an explorer of old and snorkel some of the islands most pristine and unspoiled reefs. Take a hike up to the Mayan Burial Grounds or relax with a picnic on the beach. This is a great trip to get to know the real Utila! Truly an epic adventure! The folks at the Venue, in Chepe’s Beach offer this great trip, however you can also arrange it with other people in town. Subwing, fly through the water! One of the most unique and exclusive ways to explore the wondrous underwater world! The Subwing is a modern invention that will allow you to fly in the underwater, and it is available in Utila The Venue. This is the water sport of the future but you can enjoy it now in Utila. Head on out to, at Chepe’s beach and arrange to experience this unique toy! As far as we know, this is the only spot on the bay islands where you can enjoy this unique experience! Surely this activity is becoming one of the things to do in Utila you can not pass on while on the island! Utila is one of the few places on earth where you can find whale sharks throughout the year. Different dive shops, as well as The Venue and the Whale Shark and Oceanic Research Center offer alternatives for responsible encounters with these gentle giants. With a bit of luck, you may see and even swim with these, the largest fish on earth! This is one of the unique things to do in Utila that you should certainly consider!